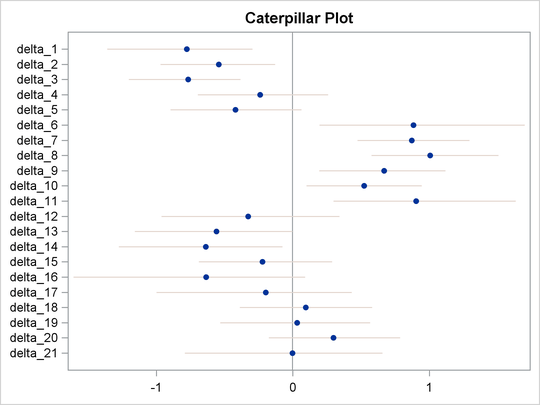 The caterpillar plot is a side-by-side bar plot of 95% intervals for multiple parameters. Typically, it is used to visualize and compare random-effects parameters, which can come in large numbers in certain models. You can use the %CATER autocall macro to create a caterpillar plot. The %CATER macro requires you specify an input data set and a list of variables that you want to plot. Figure 59.17 is a caterpillar plot of the random-effects parameters delta_1–delta_21. If you want to change the display of the caterpillar plot, such as using a different line pattern, color, or size of the markers, you need to first modify the Stat.MCMC.Graphics.Caterpillar template and then call the %CATER macro again. Figure 59.18 lists the source statements of the template that is used to generate the template for the caterpillar plot. You can use the TEMPLATE procedure (see Chapter 21: Statistical Graphics Using ODS) to run any modified SAS/GRAPH graph template definition and then call the %CATER macro again. The %CATER macro picks up the change you made to the Caterpillar template and displays the new graph accordingly.